To compete in the Olympics, an athlete essentially has to dedicate the better part of his or her life to mastering a particular sport, and that has been the case for at least half a century. But somehow, some way, records continue to be broken — even shattered — every time the world's best athletes gather to show off the fruits of their labor. So that raises the question, how do Olympic athletes keep breaking world records? It's not as if we're seeing the benefits of human evolution within the span of four years, and we have to be pushing the limits of the strength, speed, and agility of the human body... right?! There are reasonable scientific explanations for how Olympians are able to continue to leave world records in the dust, and those explanations fall into three important categories — the inability to control randomness, improvements in technology, and limited sample size. As you might have noticed, while world records in swimming get busted seemingly every race, events like track and field have much longer-standing top-times. Since women have been competing in the Olympics, across the board, women have made greater strides in most events than men because the emphasis on and participation in women's sports has increased dramatically while the sample size has remained, by definition, smaller than that of our male counterparts. In the Olympics, even the weather can impact a race such that world records would either stand or be taken down. If it's too hot or too cold, athletes' muscles can be more or less prone to cramps. If the air pressure in a certain city is not what an athlete is used to, or conversely, is perfectly suited for the training he or she has completed, that can give an Olympian the edge he or she needs to set a new record. Fractions of seconds, centimeters, and one odd twitch of a muscle can wildly change the outcome of a race or competition. 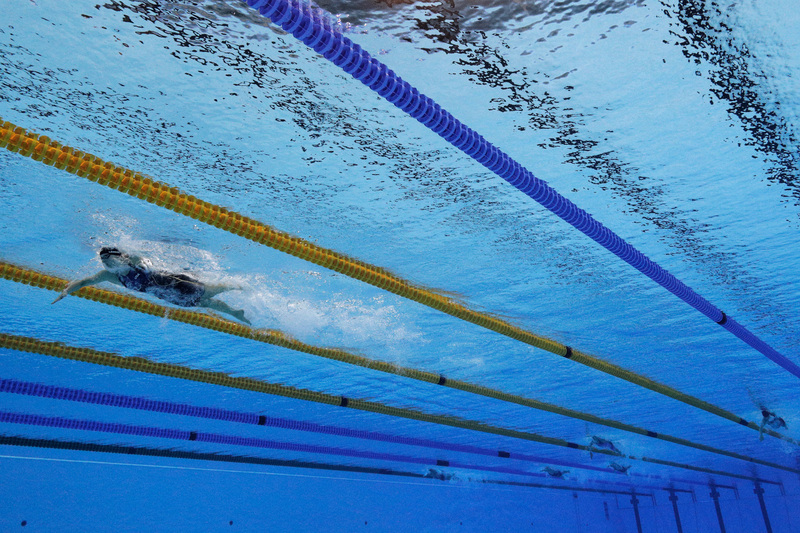 Improvements in technology have specifically contributed to the large number of records being broken in swimming events. Everything from the shock-absorbing lane dividers that reduce ripples from swimmers in adjacent lanes to improvements in water temperature control and even the designs of swimsuits and goggles have allowed Olympic swimmers to get through the water faster than their predecessors. In cycling, when carbon fiber bike frames were introduced, the Olympics saw a ton of records being broken. But it's not just gear that has gotten slicker over the years — improvements in medical science and better wisdom surrounding training programs in all sports allows athletes to be the most prepared that anyone has ever been. Women's sports and newer sports like mountain biking and kayaking will also see larger numbers of world records broken just because there is a much smaller sample size of elite athletes competing in those particular events. Statistics suggest that as the sample size of Olympic times increases, so too do the odds that we've already seen a truly special stars-aligned performance in that particular event. Similarly, with fewer performances from which to draw data, the greater the chance that the best is yet to come.